Unemployment is a temporary phase of life where a person does not have a job or lacks opportunities to earn from employment owing to multiple reasons such as layoffs. Unemployment is one of the yardsticks to measure the economic stability of a country. Governments and agencies across the World infuse the system with multiple programs and schemes to improve the unemployment situation in their geography. In order to address this issue, unemployment has been broken down into many categories(based on multiple factors) for research work. One of the most widely accepted division of unemployment is based on the its economic impact. 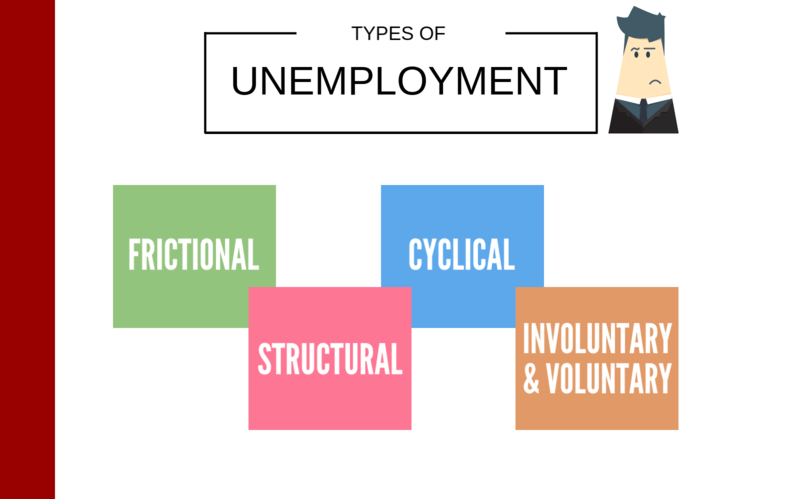 Let us explore the different types of unemployment based on economic principles. This type of unemployment occurs as workers(who left existing job voluntarily) take some time to move to another job. Some workers resign after finding a job while a large swathe of workers quit and look for jobs. There will be a time lag in finding a new job that matches their skill/experience. Some of them might even be contemplating on taking up a course/college degree to better their chances of getting a better job profile. From an economic point of view, Frictional unemployment is not really a concern as it happens in smaller numbers and extends for a short period. Rapid advancement in technology and govt. policies over the last two decades have taken away the negative limelight from this category of unemployment. Fresh college graduates looking for employment also fall in this category. This can occur due to multiple correlated reasons such as less demand for skills/education in the job marketplace. More workers in the market with certain skillset than the jobs in demand or when wages do not match the market standard also fall in this category. Technological advancement and finding cheaper employment from other geographies are some of the reasons that lead to structural employment. Seasonal employment also falls under this category since the skills a worker possesses are in demand only for a definite period. These workers remain unemployed for a definite part of the year owing to nature of job. Example: Lifeguard at a beach holiday resort. Structural employment is quite a serious concern since it can be active for a long period of time. Massive Job losses during down phases of economy is very common and during stable upward economic growth, millions of jobs are created owing to optimism in sentiments. Cyclical unemployment is the term used to described the ups and downs associated with business cycles in an economy. It is quite a natural occurrence for jobs to fall during recession due to fall in demands and similarly, they are expected to rise during stable economic growth. Economic stability has a direct say in Cyclical employment which can be the cause for creation or destruction of millions of employment opportunities. As the names suggest, this basic classification of employment is in terms of the “reason” for separation from the job. If a worker quit voluntarily to pursue better opportunities/aspirations, it is termed as Voluntary unemployment. On the other hand, if a worker was laid off by the employer, it is known as Involuntary unemployment. In US and major countries across the World, workers who are unemployed due to involuntary reasons such as layoffs are eligible to receive a weekly monetary compensation disbursed by labor department of the respective states which is computed on the basis of last drawn salary. In all the 50 states plus D.C, you can receive up to 26 weeks of unemployment insurance.